Timed to offset the big Apple Music launch earlier this week, popular music streaming service Spotify has finally closed its latest financing round. Among the investors is Sweden’s main carrier, Telia Sonera, which today announced that it is investing $115 million for a 1.4 percent stake in the company. Telia Sonera is the only company making a public confirmation of investment at this point. Prior to the carrier’s announcement, the Wall Street Journal reported, citing sources, that the full round is worth $526 million at an $8.53 valuation. While Telia Sonera’s stake values Spotify at around $8.2 billion, sources tell us that the higher valuation and total round size are both accurate. We have contacted Spotify and it has declined to provide a comment for this story. Meanwhile, we’ve also confirmed most of the investor list reported by the WSJ. One investor reportedly involved, Abu Dhabi’s sovereign-wealth fund, is not investing after all. British asset managers Baillie Gifford, Landsdowne Partners and Rinkelberg Capital; Canadian hedge funds Senvest Capital and Discovery Capital Management are also in the round; as are Halcyon Asset Management, GSV Capital, D.E. Shaw & Co., Technology Crossover Ventures, Northzone, P. Schoenfeld Asset Management and Goldman Sachs. Telia Sonera is a longtime partner of the music streaming startup founded in its backyard. It was the first carrier to partner with Spotify for bundled music offerings alongside broadband and mobile subscriptions, a model that Spotify subsequently exported to many other carriers globally to ramp up its premium subscriber numbers and users overall. “We have a long and great relationship with TeliaSonera and I’m pleased we’re able to take this to the next level together with this strategic partnership”, said Daniel Ek, CEO and Founder, Spotify, in a statement. Telia Sonera notes that this is a strategic partnership. “Both companies are also committing resources, staff and other assets to ignite the joint innovation agenda within areas such as media distribution, customer insights, data analytics and advertising. A joint TeliaSonera-Spotify team will be set up to run the projects,” it says. As users flock to more services like Spotify that run over third-party networks, and hardware makers like Apple and Internet companies like Google continue to develop services that link up directly with consumers, carriers are regularly worried about being relegated to “dumb pipe” status, leading to low margins on commoditized infrastructure. Telia Sonera is very much also following that line. “We’ve set-out to create a New Generation Telco where innovation is key to our success. Spotify is a great company, loved by customers and with a world class take on innovation I’m excited to join Spotify’s journey as investor and key partner”, says Johan Dennelind, President and CEO, TeliaSonera, in a statement. While Telia Sonera may be working on how to build or bundle Spotify services at the consumer-facing end of the business, there is another area where the two may work together. The telco has a very large wholesale business called Telia Sonera International Carrier covering some 43,000 kilometers of fiber globally. It works with companies like Facebook, Activision Blizzard and Twitch to provide bandwidth to run services. (As one example of what it does, it provides an optical network to Facebook that connects up Europe, Asia and Africa with Facebook’s data center in Lulea, Sweden.) As Spotify grows bigger and moves into services like video, it will be needing to focus on the costs and efficiencies around delivering that content to users, so this is an area where Telia Sonera could help Spotify, too. Spotify is currently one of the world’s biggest streaming music services, with 15 million paid users and 60 million users overall across its global footprint. Apple, which acquired Beats Music in a $3 billion+ deal last year, is bullish on its own music ambitions, reportedly with a target of hitting 100 million subscribers in its 100-country launch. To do that, it will likely be digging into Spotify’s own subscriber base. 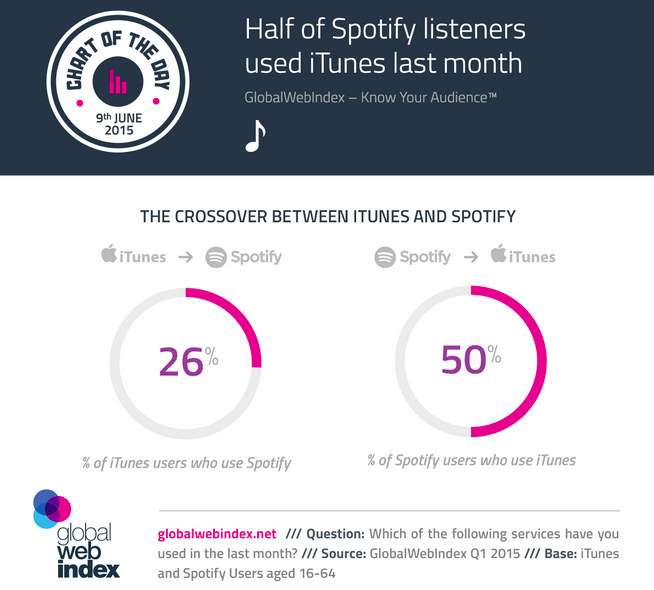 Numbers from the Global Web Index indicate that right now there is a significant crossover between the two services, with half of all Spotify users also using iTunes in the last month. What’s more, it is not a mirrored effect, with only around one quarter of iTunes users also using Spotify, presenting a market opportunity for Apple to offer those existing iTunes users its own streaming service.